Letter from LP to Chancellor Lawrence A. Kimpton RE: writes because he has heard of and is disturbed by a rumor that the University of Chicago is losing their preeminent place through the loss of some of their outstanding professors and a failure to replace them by promising men. Is personally concerned about this and offers to help remedy the situation. [Letter of response from Lawrence A. Kimpton to LP December 24, 1953]. Letter from LP to Dr. F. J. Allen RE: thanks him for his letter and writes that he is to soon leave on a three-month trip around the world. [Filed under LP Correspondence: Box #5, Folder #3]. I thank you for your letter of 10 December, and for your efforts to obtain a satisfactory solution to the situation about the application for membership in the American Chemical Society by Mme. Joliot Curie. I may say that I do not understand the situation at all. I judge that you have some information that I do not have, and perhaps I have some that you do not have. I am very much troubled by the sentence in your letter "Certainly it appears to be a communist trap designed to embarrass us." It seems to me that the only thing that embarrasses the American Chemical Society is the action of its Membership Committee. What possible embarrassment could there be to the American Chemical Society if Mme. Joliot-Curie were to be accepted as a member? On the second page of the letter you say "Sincerity of purpose is an obvious requirement for the privilege of membership in the ACS or any other organization. A person who applies for membership for political purposes or to create political difficulties should be denied admission." Do you have any evidence whatever of a lack of sincerity of purpose on Mme. Joliot-Curie's part in applying for membership in the ACS? It seems to me that the American Chemical Society could expect to have Mme. Joliot-Curie as one of its members. She is interested in chemistry -she received the Nobel Prize in Chemistry. I do not know whether she has the journals published by the American Chemical Society conveniently available to her; if not, I can understand that she would apply for membership in the Society in order to have its journals in her own office, for ready reference. I should think that she would have just as much reason for applying for membership in the American Chemical Society as almost any other of the approximately 100 French scientists who are now members. Accordingly I should like to ask you what evidence you have of a lack of sincerity in her application. granted membership the American Chemical Society would then be embarrassed through having a communist as a member - a French communist. I had not known that the American Chemical Society had any political condition for acceptance of its members. I have read in the papers, however, that about 20 percent of French voters are communists, and that the percentage among scientists is higher. I assume accordingly that about 20, or perhaps more, of the French members of the ACS are communists. Also, I should like to ask you if you know that Mme. Joliot-Curie is a communist? When I was in Paris some years ago I was told by one of the men at the Sorbonne that it was thought that she was not a communist, although I think it was known or believed that her husband was a communist. Also, I was told at that time, and again two months ago, when I visited the Sorbonne, that Mme. Joliot-Curie is not at all active politically. 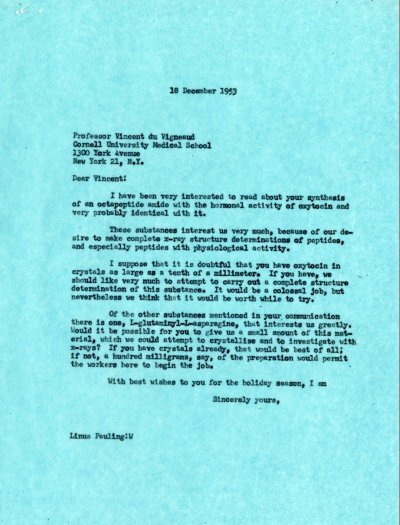 I think that she may have signed the petition to President Eisenhower, asking clemency for the Rosenbergs - I judge from Monod's letter published in the Bulletin of the Atomic Scientists that practically all French scientists signed this letter. My impression is, however, that the statement that she is not active politically may well be correct. There is one more piece of information that seems to me to throw some light on the situation. I was told by one of the chemists in the Sorbonne that when Mme. Joliot-Curie received the letter saying that she was not accepted for membership she told her colleagues that she thought the American Chemical Society must consider her work to lie in the field of physics, rather than in the field of chemistry. The men to whom she spoke, I was told, then suggested to her that this could hardly be the proper reason for refusing her membership, since her work in fact did have some bearing on chemistry - enough to have got her the Nobel prize - and that probably the action was to be attributed to the anti-communist feeling in the United States. When I saw her it was evident from her remarks that she now thought this to be the explanation but that she did not have anything more than this general explanation. Can you tell me if she has been given an answer to the letter that she wrote some time ago, asking for a statement of the reasons for the refusal of membership to her? I should be grateful if you could answer this letter immediately. I have delayed my departure for India, and your answer may well get to Pasadena before I leave. Letter from LP to Mr. Lionel I. Rebhun RE: Hopes that he received the reprints that were sent to him. Goes on to describe the situation with the structure of nucleic acids as it pertains to himself and Prof. Corey. [Letter from Mr. Reghun to LP July 25, 1953] [Filed under LP Correspondence: Box #340, Folder #18]. Letter from V. Vand to LP RE: Requests that LP tell him of any available positions that he knows of that would be suitable for him, as his contract at State College is expiring soon. [Letter of response from LP to Dr. Vand March 16, 1953] [Filed under LP Correspondence: Box #427, Folder #13].